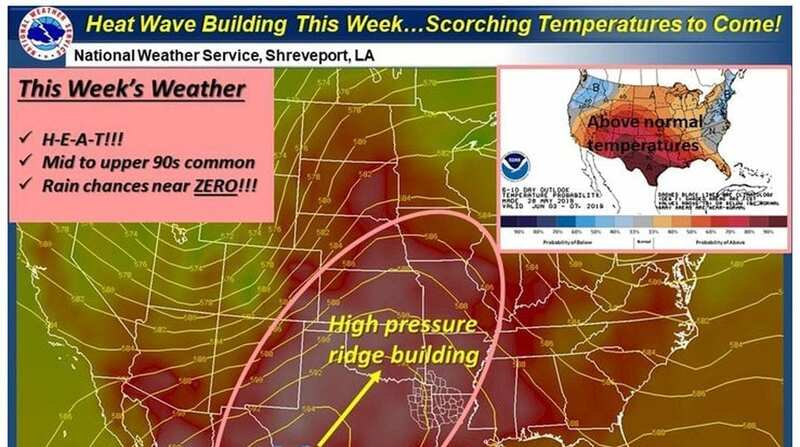 An early summer heat wave is likely to hit Bossier-Shreveport this weekend, according to the National Weather Service. Beginning today and stretching throughout the weekend, temperatures will reach the upper 90s in the afternoons with heat indexes climbing into the 100 degree range. A summary from the NOAA Climate Prediction Center said heat index values are likely to remain at or above 105 degrees F through early next week for the South. Much above-normal temperatures, maximum temperature anomalies of 10 to 15 degrees, are also forecast. The NOAA Climate Prediction Center noted there are indications that this temperature pattern may dominate most of June. The unusually high temps for this early in the summer season can create problems. Heat is one of the leading causes of weather-related fatalities, resulting in hundreds of deaths each year in the United States alone. • Hot cars can be traps. It is never safe to leave a pet, child, elderly person, or disabled individual locked in a car. • Listen to or read weather forecasts to stay abreast of potential temperature changes as well as the heat index. • Stock up on fluids. Avoid drinks with alcohol or caffeine. • Limit strenuous activities. Reschedule outdoor activities if there is a heat wave, or move them to cooler times of the day. Spend the hottest portion of the day, usually between noon and 3 p.m., in the shade or inside in the air conditioning. People on job sites should take more frequent breaks and find shade whenever possible during these hours. • Loose-fitting, lightweight, light-colored clothing will help keep you cool. • Be aware of nausea, weakness, elevated body temperature, clammy skin, confusion, and delirium are some of the symptoms of heat-related illnesses. • Check on the elderly or others who may have difficulty finding cool places to spend their day.